Whenever any player attacks, Guan Ping can discard any card to allow that player to attack again during that turn. 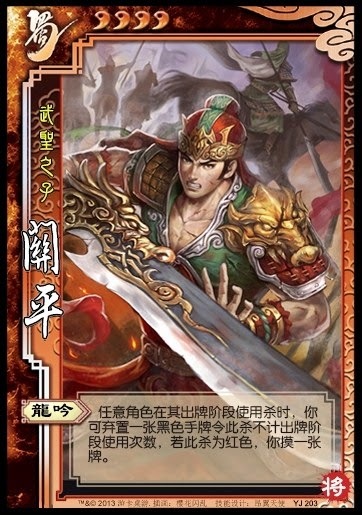 If Guan Ping activates this ability in response to a red-suited Attack, he draws one card. Guan Ping can activate "Dragon Roar" during his turn or during any other character's turn. 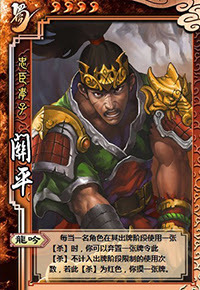 Guan Ping can discard any of his cards to activate "Dragon Roar," whether they are in his hand or equipped. 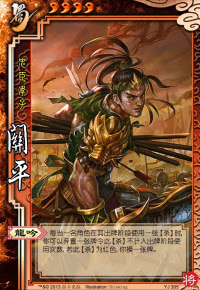 Guan Ping can use "Dragon Roar" as many times during any turn so long as he has enough hand cards and the character taking their turn has the Attack cards to keep the process going. Guan Ping is a thinly-veiled attempt to make Guan Yu relevant in this game. This is starting to become pathetic. Guan Yu has three characters that were specifically designed to be weak to him (Yu Jin, Hua Xiong, and Yan Liang & Wen Chou) and now a character specifically designed to 'bump him up' further in terms of usability. We doubt that Guan Ping will actually make Guan Yu a more frequently used character, as the previously-added have not added much to his usability. Outside of use with his father, Guan Ping seems to be a passable character. "Dragon Roar" must be used carefully. If Guan Ping overuses this ability on black-suited Attacks, he and his ally will run out of cards quickly. This ability should be saved for allies using red-suited Attacks or on allies that are trying to kill a weak opponent. As always, communication is key. Guan Ping should not use "Dragon Roar" when an ally is using their last Attack card if it is of a black suit.